The Pathway Modular Access System allows for infinite modular ramp configurations, creating safe and seamless access for both standard and unique entryways. 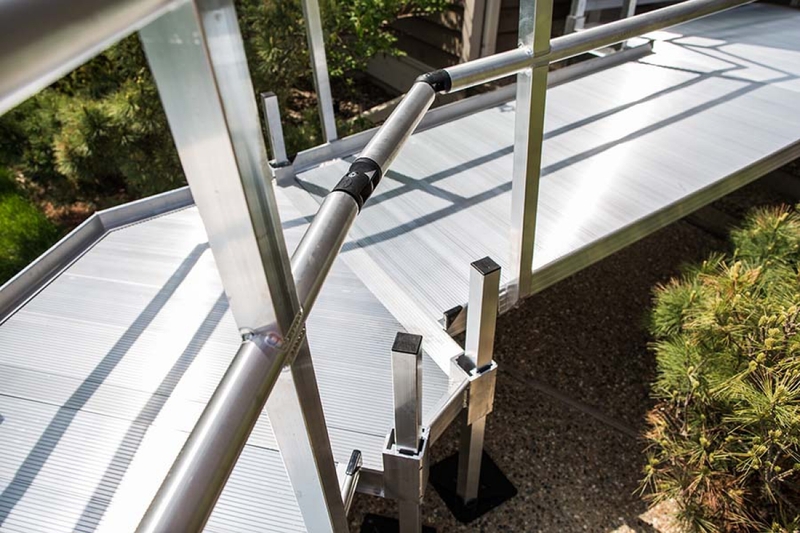 The Pathway Modular Access System is made of high-strength aluminum which will not deteriorate from the outdoor elements and features a slip-resistant surface that maintains traction in any weather condition. The Pathway Modular Access System installs quickly, which means minimal disruption for you and your family. Typically, a 24-foot system can be installed, including handrails, in less that 30 minutes. There are many advantages to the aluminum Pathway Modular Access System over its wooden counterparts. It is virtually maintenance free, it will not rot or rust, and its environmentally friendly. The Pathway Modular Access System will not affect your home's property value. The Pathway does not alter or add to the structure of the residence – no poured footers, no construction – just assembly. The specifications for the PATHWAY® Modular Ramp System vary, depending on the configuration. This all-aluminum modular entryway mobility ramp is easy to install and will last much longer than wooden entryway mobility ramps of similar design. See the Pathway Modular Ramp System specifications below. With the PATHWAY® Modular Access System, you can be confident that accessibility to your home will be provided correctly, completely, and safely. The Pathway Modular Access System is the perfect accessibility option for residential settings when you’re looking for something sturdier and more permanent than a portable ramp. This American-made modular system consists of ramps, stairs, and platforms, all of which may be combined and configured in a variety of ways to provide a customized fit to your home. Made of durable aluminum. Powder coating options are also available. The Pathway Modular Access System will not affect your home’s property value. The Pathway does not alter or add to the structure of the residence – no poured footers, no construction – just assembly.